TOPIC:	Access driver is incompatible : 32-bit or 64-bit ? 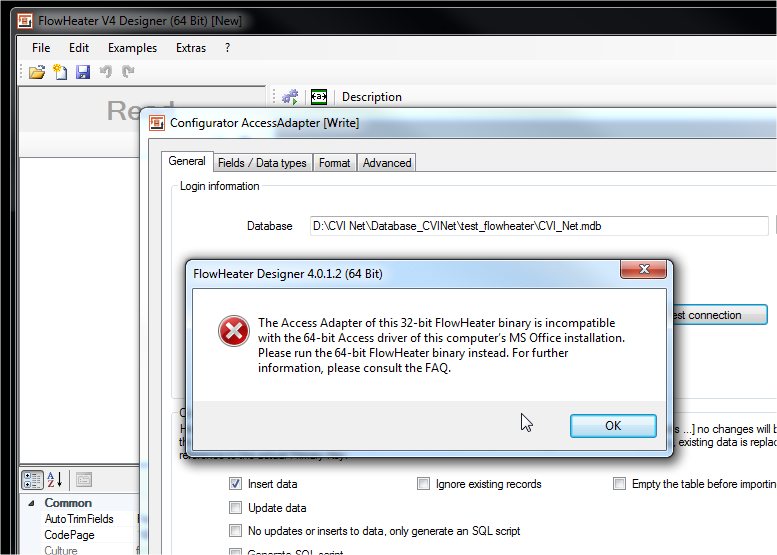 "The Access Adapter of this 32-bit FlowHeater binary is incompatible with the 64-bit Access driver of this computer's MS Office installation. Please run the 64-bit FlowHeater binary instead." But version of FlowHeater I am using is a 64-bit version : FlowHeater Designer 4.0.1.2 (64-bit). I guess just the error message is wrong , could you please try the 32 Bit Version instead? Note: It´s possible to install both FlowHeater versions (32/64 bit) on the same PC! In case Access isn´t installed on this PC you have to install the “ Microsoft Access Database Engine “ first to connect to your Access Database. Note: If you use the 64 Bit FlowHeater version you have to install the 64 Bit “ Microsoft Access Database Engine “. downloading and installing 64-bit "Microsoft AccessDatabase Engine" solved the issue.